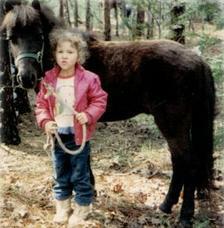 When Tawnee was 4 years old she lived next to a kill buyer who sold his horses for slaughter. For the next 8 years Tawnee would go and take carrots to his horses and pet them over the fence. There was one horse she named Blaze. Almost every day she would go visit Blaze. Tawnee wanted to own Blaze so bad. She loved her pony she got for 5th brithday, but she was older now and wanted a big horse. Tawnee thought of nothing else but having Blaze as her very own horse. One day when she went to see Blaze he was gone. Gone just like all the other horses that had come and gone over the years. Tawnee’s heart was broken, Blaze would never be her horse. When Tawnee was 10 years old her parents decided that she was old enough to get a horse of her very own. They went to the BLM Wild Horse Adoption Center near Susanville, CA. They adopted Donnay, a black Mustang mare. She watched her mom training Donnay and could hardly wait for the day when she could ride her. On Donnay’s first ride she got scared and bolted, throwing Tawnee’s mom on the ground and broke her arm. After that Tawnee took over the training since her mom could not keep training Donnay with a broken arm. Before long Donnay and Tawnee where able to go on trail rides and the two of them had many wonderful years together. Early in life Tawnee decided that she wanted to become a Veterinarian Technician. Unfortunately she had a hard time in school. She was dyslexic and reading was very hard for her. Tawnee was determined though and worked hard at her lessons, with big dreams of being a vet tech. When Tawnee was 11 years old she and a friend were playing in a horse pen when she was kicked in the head and her back by her mom’s horse. Her friend ran for help and when Tawnee’s dad found her she was not breathing. They rolled Tawnee on a board to move her out of the horse pen and she started breathing again. She was rushed to the hospital. Tawnee had head trauma, a very serious concussion, and a bruise in the perfect shape of a hoof paint in the middle of her back. Despite being released from the hospital the next day she was still in horrible condition. She could not walk, eat, drink, use the bathroom, or do many other normal daily activities without assistant. The kick to her back caused her to have shooting pains at times that lasted for many years. As bad as her back was, the worst injury was the dent in her skull at the Parietal Lobe section of the brain. It took 2 weeks before Tawnee was able to walk without assistants and get back to normal life again. Now, however, school was almost impossible, it was as if her brain refused to work. The damaged left Parietal Lobe resulted in problems in mathematics, reading, writing, etc. Tawnee’s dreams of become a vet tech would never happen now, her brain would not cooperate no matter how hard she tried. 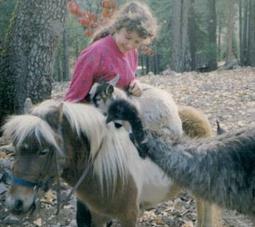 Tawnee’s teen years where filled with horses and other animals. She rescued baby ducks, goslings, an American Bison calf, kittens, and any other animal that crossed her path that needed help. 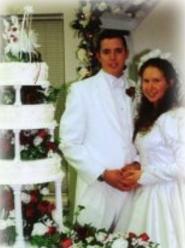 When Tawnee was 18 she married Jason, whom she had met when she was 9 years old. When she first met Jason she knew in her heart that he was the one. It was love at first sight for her. The first year of marriage was wonderful and everything Tawnee dreamed it would be, but there was a hole in her heart: they didn’t own any horses. 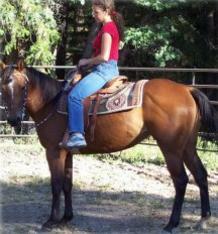 In 2003 at 19 years old Tawnee knew she had to get a horse. She decide to go the auction where her old neighbor, the killer buyer, would go. At the Tawnee purchased Skip, a 4 year old Quarter Horse mare that was completely unhandled. Within 1 week Tawnee had her halter trained and under saddle. 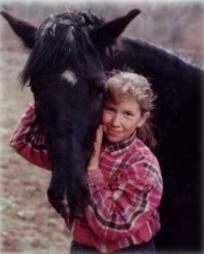 Tawnee loved Skip, she was her dream horse. Tawnee started thinking about all the other horses at the auction just like Skip. Most of them would end up in the slaughterhouse just because they were unhandled and nobody wanted them. After several months Tawnee decided to sell Skip for $1,800 and found her a great home. With that money Tawnee went back to the auction and rescued more horses, worked with them and found good homes for them all. 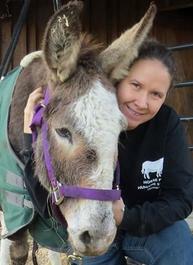 Tawnee enjoyed operating the small rescue, named NorCal Equine Rescue, which become a 501(c)3 nonprofit in 2005. Tawnee wished they had more money so they could rescue more horses. Jason was working full time and they funded the rescue personally. One day Tawnee answered the phone, not knowing that this phone call would change everything. It was a lady looking for a horse rescue to donate $150,000 to. Her aunt and uncle had passed away and they wanted part of their estate to be given to a rescue to help horses in need. This donation was graciously accepted. Tawnee and Jason started rescuing more horses and finding good homes for them. Within a couple years they where rescuing hundreds of horses every year. Tawnee started working on getting her high school diploma so she could further her education in the animal rescue field. It was an exciting day when she got her diploma! Tawnee and Jason started getting training that would help them in the animals rescue field. This training helped them to operate the rescue in a professional and efficient manner and help as many animals as they could with funds available. By 2010 the rescue had clearly outgrown it’s name. Tawnee and Jason were helping horses across the United States. Previously unwanted horses pulled from the slaughter pipeline were finding good homes across the United States with adoptions from Hawaii to North Carolina. They were also helping many other kinds of animals as well. After much discussion and debate, the Board of Directors changed the name to Horse Plus Humane Society. Humane Society’s are all separate organizations focusing an animal welfare, Horse Plus Humane Society is not affiliated with, nor do we receive funding from, any other local or national organization that also includes the name “Humane Society” in it. Tawnee started doing undercover work in the slaughter pipeline in California. In California it is illegal to sell or ship horses for slaughter. During the time Tawnee was doing the undercover work the first arrest for shipping horses to slaughter was made. It was the first arrest since the law passed in 1997. Tawnee established ground breaking programs to help horses in need. Some of these programs had never been done before. The programs included Safe Surrender Site, Last Act of Kindness, Low Cost Gelding, and the Extreme Rescue Makeover. In 2014 Horse Plus Humane Society opened a branch shelter in Norman, OK. This shelter is in the heart of kill buyer country. Kill buyers fill up their trailers and make the short trip into Texas and then the horse are shipped on to Mexico for slaughter. 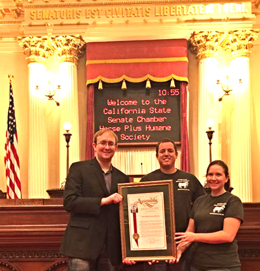 In 2015 the State of California recognized Tawnee and Jason, and Horse Plus Humane Society, for their accomplishment in serving the horses of California by an award. Tawnee and Jason went to the State Capital of California to receive their award plaque. Tawnee never dreamed that what started out as her little rescue would have grown so big that the State of California would recognize her hard work in rescuing horses in need. In 2015 Horse Plus Humane Society open a 3rd shelter in Tennessee. Tennessee is home to the Tennessee Walking Horses. Tawnee has become very involved in exposing the horror of the Tennessee Walking Horse industry. Horses are tortured to make them do an unnatural gait called the Big Lick. They burn the horse’s leg skin with chemicals to make their skin painful, then they put chains on their burned skin to make the horse do the Big Lick. Tawnee and Jason are dedicated in Horse Plus Humane Society and helping animals in need. They oversee the 3 shelters ensuring the shelter are operating properly and providing excellent care the the animals in their care.